I have not done a Rover post in a while, simply because I have not worked on the vehicle in a while. I have not been idle on that front however, as I’ve been hoarding Rover parts for at least a year, and quite possibly two. Since my work truck now has a body shop appointment, due to an Out of State Trespasser, I will need the old Land Rover for a week or two on the job, so my motivation to rid the Rover Hut of parts has grown considerably. As in life, one part going out, leads to the replacement of several others, and such is the World of Land Rovers. After installing the new Turner engine in San Antonio, I found that this motor was not happy with the standard mechanical fuel pump. I then installed an inline electric pump, which made all the difference. The added benefit to the electric pump, was that the problem of vapor lock dissipated. Living in Alaska, vapor lock was like the Yeti: the stuff of legends. Traveling in Texas and Mexico, brought the beast out into the realm of reality. The electric pump recently fried out, which started this whole affair. The last time The Rover was in the Lower 48, my gas tank started to leak at the seam. I had heard that rubbing Ivory bar soap at the point of the leak, would seal the thing, and sure enough, Ivory worked like a charm. In fact, that field repair ended up lasting several Years, and yes, I meant to capitalize that. 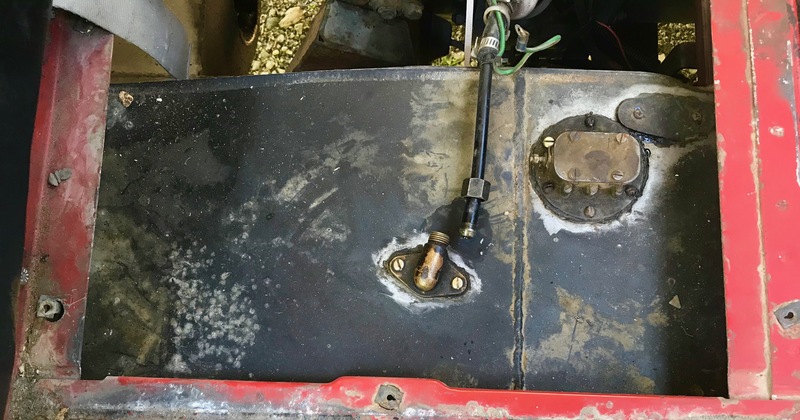 Obviously, once one replaces the fuel pump, one might as well replace the leaking tank, especially since a new tank is sitting under the work bench. Dropping the old tank on this truck is relatively easy, although a tad harder when it is almost full. One thing that constantly amuses me, hours later, is how a simple item like a gas tank can change over the years. One would think at 52 years old, the mold would be kind of locked into a pattern, but no. This isn’t the first time I’ve replaced the tank, so I know that the tank has grown in length incrementally over the years. That is only a problem due to the fact that the tank fits into a fixed amount of space. You’ll get the thing in there, but it will take a bit of pressure. Rovers North claims that the new tank has been tested for leaks. It better be, but I’ll carry a bar of Ivory just in case. 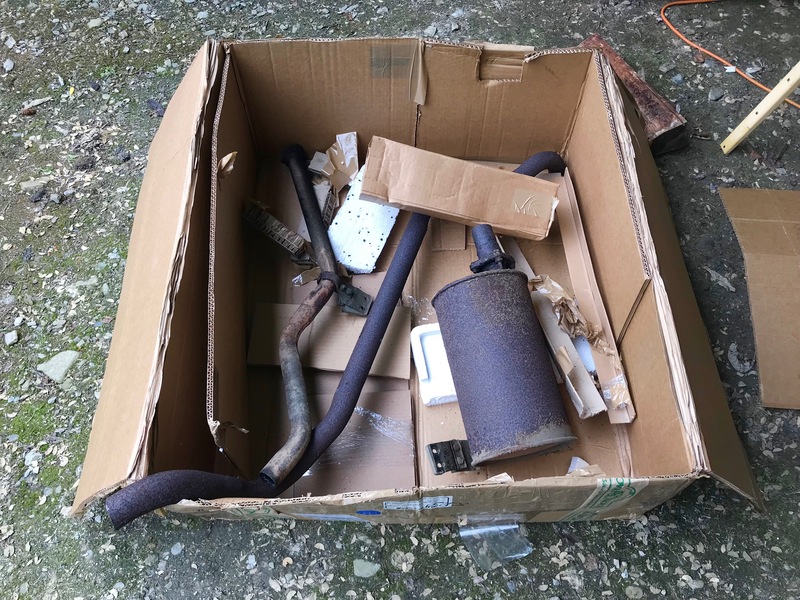 Since I was under The Rover, and the tail pipe had broken from the muffler, and since I have the replacement parts, I decided to pull the exhaust too. 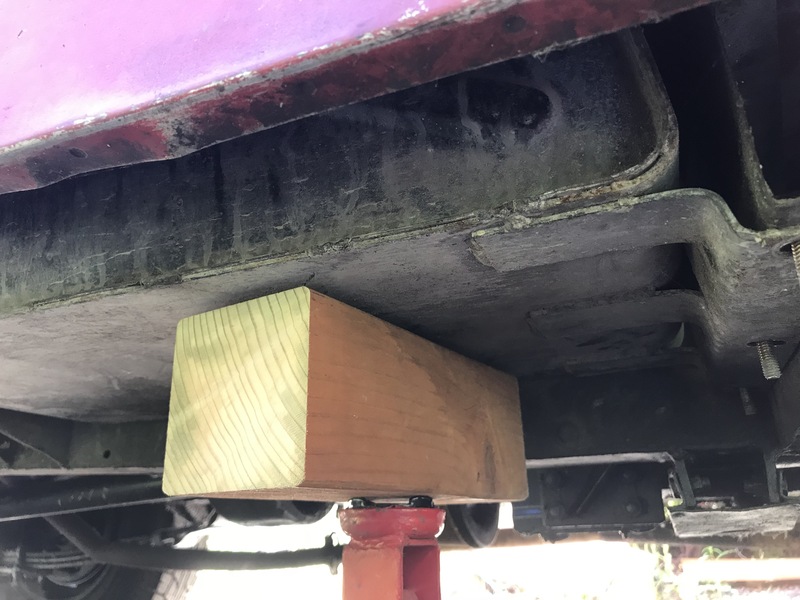 I know what you’re thinking, the tailpipe was hanging there just fine from the clamps, but there is another reason for the exhaust removal. That will be for another post, assuming the job goes in the direction of the plan. While dropping the muffler, out of the corner of my eye, I saw a brown blur racing at me. I had just enough time to jump up, and bang my head, which caused the blur to change direction before running through my hair. I thought I knew what it was, but I hadn’t seen it for a while. Sure enough, the little force of nature came zipping by me again, and this time I was able to get a good look at it. 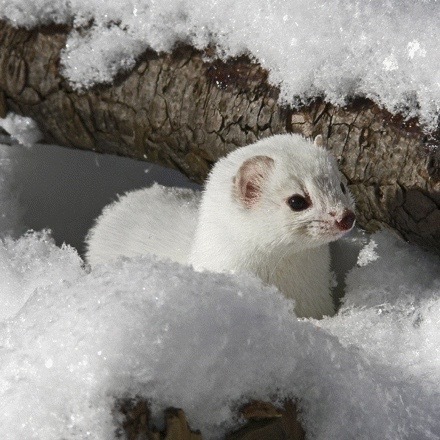 It was my resident weasel, which I’ve written about on here before. 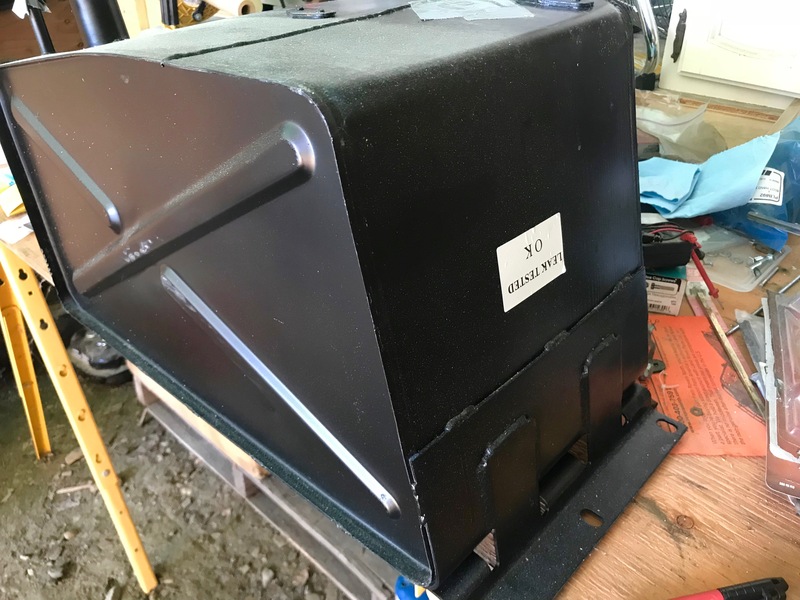 He was living in my wood shed this past winter, but as each week passed, and the wood pile became smaller and smaller, he was forced to find another place to live. He’s brown now, with the black-tipped tail. The weasel is as feisty as ever, not even remotely impressed by my presence, and quite possibly still holding a grudge. I came home from work, and by the looks of the tracks in the fresh snow, there had been quite the party going on when I was gone. At first, I was looking for the weasel’s tracks, which I found right away, but I was surprised to see grouse tracks practically right on top of the weasel’s. Upon further inspection, I found a whole covey’s worth of grouse tracks all around the yard. The rabbit tracks were also plentiful, although that was not a surprise, since I have been flushing them all summer long. I followed the story written in the snow as best I could. The new Siberian peas that had been planted two years ago, seemed to be of interest to the grouse, and I took note that the weasel enjoys visiting the Rover Hut. He probably has been entering the hut for some time, but his secret was not revealed until the recent snowfall. It made me wonder if weasels can catch red squirrels. We have an abundance of those damn, pine rats. I had a roll of insulation in the Rover Hut for a customer, and within 24 hours the red squirrels had attacked the roll, and little tufts of the stuff were all over the hut. We also are high on the rabbit cycle. A little over a year ago, the neighbor’s cat died suddenly. It was an outdoor cat, and roved the entire area. I didn’t mind the cat, and it very kindly left me gifts in my work shed if I left the door open at night, but I’m kind of glad it is gone. She was a killing machine, and left a trail littered with small carcasses. Underneath the neighbor’s house is a ghastly killing field. 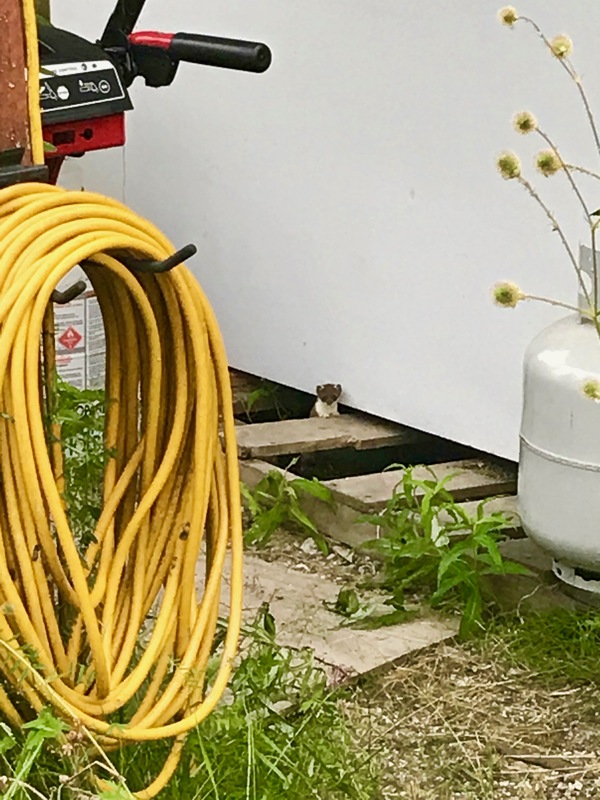 This summer, I noticed far more birds hanging around than was usual, and I expect the weasel moved in to fill the vacancy. The neighbor does have a new cat, but it’s terrified of the outdoors, and can not be coaxed out the door, which secretly thrills me, and less secretly amuses me. I told the neighbor to just embrace the new cattitude, and enjoy the fact that this pet is entirely different from the last one. I left out the part that I’m starting to prefer the weasel, if only for a change of pace. 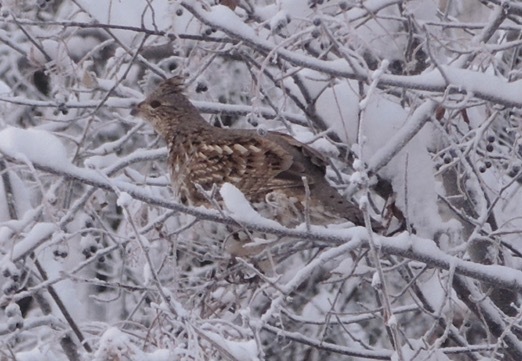 After reading the snow, I went on my late afternoon walk, and flushed three ruffed grouse just down the trail from my place. The sound of those beating wings, and the sight of those zig-zagging brown rockets is a great way to forget one spent any time at work at all.